A departure from my normal content, and the last posting for what has been a busy day for the site. 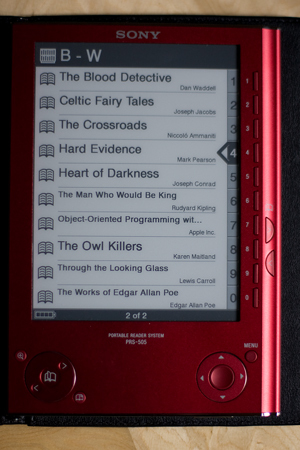 I got an eBook reader for my birthday about 3 weeks ago. I was torn between the reader and getting the lesser of the two SpeedLites, the 430EX II, which weighs in at roughly the same price. I think I push my luck with my friends with my photography addiction at the best of times, and blinding them into the bargain – well, maybe one for next year. 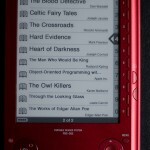 I’ve been looking at getting an eBook reader off and on for about the last year. I have a long commute – about 1.5 hours each way – and tend to chew my way through a lot of books. I also tend to read quite a lot of hardbacks, which I never take on holiday given the bulk / weight. The primary concern has always been content: the options in the UK, which remains Kindle-less, seem to be a lot more limited than in the US. The site that changed my mind was Waterstones, which has quite an extensive catalogue. The pricing can be a shock to the system given what we have grown used to c/o Amazon, but there is the odd bargain to be had. The battery life, page-turn refresh rate, user interface, and screen readability are all as advertised: fantastic. The software is the only wrinkle that I’ve found. It’s frustrating that it’s a PC only option for any books that are DRM protected. I tried a number of options on my Mac, with varying – and generally low – degrees of success. I refuse to use BootCamp to dual boot: it just has ‘should have bought a PC’ written all over it. I had a quick look at emulation, and first stop was Wine, which has transformed into a commercial product called CodeWeavers CrossOver Mac. I couldn’t get it to work, and googling suggested that no-one else had tried. The next option I could have taken was Parallels which I know works, but throw in the cost of the software, and a copy of XP, and it was starting to look like an expensive option. I have had a play with Calibre, the open source solution for communicating with the eBook. It works pretty nicely. The mechanism for recursively downloading content from websites [reminiscent of Sunrise, which I used years ago for offline content reading with my old PalmPilot] was quite nice. It’s also an option for some of the open formats. But bottom line, it will not do the crypto necessary for the DRM in the epub standard. So, I caved and installed the software on my wife’s laptop. I had a couple of problems with my first purchase from the Waterstones’ website. The file you download when you pay for the book seems to be a stub that the Adobe software, Digital Additions, then uses to haul the actual book content down with. The problem I had was an error in the payment process: the payment was being rejected consistently. The workaround was easy: launch Digital Editions before buying the book. So for the long term usage perspective: I’ve churned my way through about four books in the last 3 weeks, and I am loving it. We’ll be going on holiday in just over 3 weeks time and it will really come into its own. The book comes with a CD of 100 titles that have lapsed into the public domain. I’ll read the Celtic Fairy Tales – one day :-). I referred in my original article that the ebook purchasing process appeared to generate a stub file. I’ve just found one from one of my first purchases. It’s a blob of XML containing ‘fulfillmentToken’ data, including some Dublin Core metadata on the book, and ultimately a URL [ephemeral and DRM protected no doubt] where the ePub file gets hauled down from.